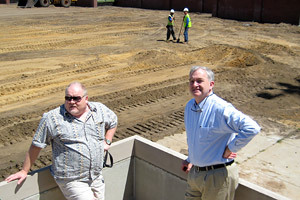 Mike Pease (L) with DCI Executive Director Dan Acheson. Drum corps will be invading Michigan City, Ind. this weekend as corps participate in an annual DCI Tour event and Fourth of July parade. The 49th annual Pageant of Drums event and parade, both on Sunday, July 5, are part of the Michigan City Summer Festival, a series of more than 50 events that run from mid-June to October. 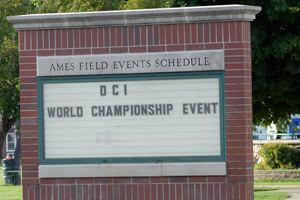 The event will be a precursor to the 2009 DCI World Championship Open Class Quarterfinals which will return to the city's Ames Field for its second year on Aug. 4. All of these events are happening mainly because of the work and dedication of one man: Mike Pease. This is Pease's 12th year organizing drum corps events in Michigan City, and after Sunday's show and the Open Class Quarterfinals, he will have put on 17 drum corps events. He also is in charge of coordinating all the musical groups for the parade, which include three high school bands, a municipal band and nine drum corps this year. Over the course of the 2009 season alone, Pease will coordinate more than 65 nights of housing in local schools for different corps in Michigan City, including all of the Open Class groups when the World Championships come through town. Even through a battle with lung cancer, Pease has never stopped giving of himself. All of his hard work has not gone unnoticed: This year he was named the Grand Marshal of the parade and festival, though he jokingly says he doesn't know how that happened. "I heard a rumor that somebody went and talked to the mayor back in the winter," he said. "But really, I'm honored and humbled by it. I thought there were other people more deserving, but I do feel really honored that they chose me for that." 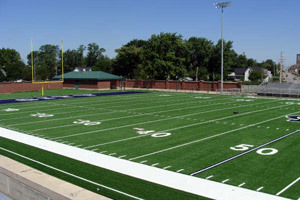 Ames Field with its newly laid artificial turf. His wife has even taken to calling him the "Grand Pooh-Bah" of the festival. Laughing, he added, "I don't even really have time for this, I have a drum corps show to run!" That show, the Pageant of Drums, will feature nine drum corps in the newly renovated Ames Field. The stadium has new artificial turf that crews just finished laying on Wednesday. It will be dedicated at Sunday's event. "It is just beautiful. I was over there today walking all over it to get a feel for it," he said. Pease said he can't even narrow down what he is most excited about this year related to the drum corps activity. "I just love it all," he said. "I like all the kids … I don't care if you're in first place or last place; I treat them all the same." Next up for Pease: preparing for the 2009 World Championships. The opening ceremonies, as well as Open Class Quarterfinals, featuring 19 corps, will be held in Michigan City before the action heads to Indianapolis. And after his part in Michigan City is done, Pease is very excited for the Finals in Indy. "I wouldn't miss it!" he said. Open Class Quarterfinals on Aug. 4. Every year, he brings a whole bus of people to the World Championships, including the mayor of Michigan City and the 11-member summer festival committee. He loves Lucas Oil Stadium because his mobility limitations don't hold him back. "Lucas oil stadium is so high tech anyone can get around … we just take the escalator and I can go anywhere," he said. "It's going to be a lot of fun!" If you are in the Midwest this weekend, Pease says to come out to the show. "We just want everybody to come and have a good time," he said. "I think we do a really good job here, and people like coming to Michigan City because the atmosphere in the stadium is so nice. It's going to be really good this year with this new field." Learn more about the Open Class Quarterfinals coming to Michigan City on Aug. 4.